“We pray for the babies whose bodies have been poisoned by lead,” said Rev. Marshall Hatch as he led a prayer circle in Flint with a group of volunteers who had transported 16,000 bottles of fresh water to help alleviate the suffering of children, families and entire communities whose drinking water is contaminated by lead. When he prayed for the babies, tears welled up, as we were reminded that so many children have been needlessly poisoned. How can this neglect of a community happen in the United States, such a wealthy nation? Rev. Acree also specifically asked at the annual meeting of the Community of Congregations for our congregations to consider joining the Water for Life Campaign of the Leader’s Network. The Leader’s Network is a clergy-led gathering of community leaders addressing the needs of the West Side of Chicago. They also engage in humanitarian work, when crises like Flint emerge. They have a history of responding to disasters that affect underserved populations. Rev. Hatch, pastor of New Mount Pilgrim Missionary Baptist Church in North Lawndale, along with Rev. 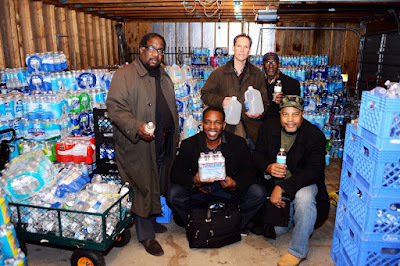 Acree and leaders from six other churches in Chicago’s West Side, had gathered funding and supplies to help the stricken population. I was invited to travel with them since my own congregation agreed to participate. We took up our own emergency collection. Rev. Cy Fields, Senior Pastor of New Landmark Missionary Baptist Church in East Garfield Park, advised me that a truck had been donated by World Vision of Chicago (a national program that helps meet basic needs of young people, such responding to disasters, feeding the hungry and offering learning opportunities.) World Vision’s generosity, however, was outmatched by those who had donated water, so we had to find another truck. 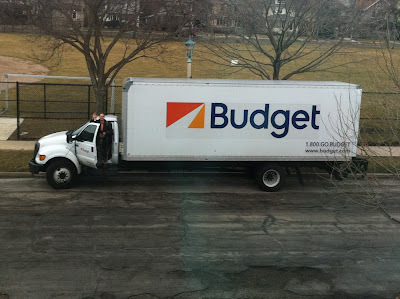 I was in charge of negotiating with the truck rentals, and ended up with a 24-foot rig, which I drove to New Mount Pilgrim, where the first truck was nearly loaded and the press had already gathered. After packing up the water, two trucks set off on a bumpy and adventure-filled drive to Michigan. Our fellow truck driver was pulled over by the highway patrol, who told him that his truck was 10,000 pounds over weight. They inspected the truck and confirmed this was a humanitarian mission, and let him continue. In late afternoon, we pulled into the lot of Flint’s Antioch Missionary Baptist Church. We created a line of volunteers who stacked the gallons of water in the Church’s garage, then ended up making a trip to a Sam’s Club where we bought more truckloads of water. We learned how many people in Flint haven’t ever had it easy and this crisis was just one more challenge to survive. Volunteers told us about having to bathe only with cold water because hot water has a higher lead content. Stories of parents learning that their children have high lead levels in their blood were the most sobering. According to the U.S. Census, more than 40 percent of Flint’s population is living in poverty, making it the second most poverty-stricken city in the nation for its size. The City itself has faced multiple financial crises that finally put it into emergency receivership. In an attempt to save money, the city council voted in 2013 to purchase water from the Karegnondi Water Authority (KWA) rather than from the Detroit Water and Sewerage Department. The KWA project was not expected to be completed until the end of 2016, so the city decided to rely on its backup, the Flint River, which had been polluted with debris from the auto plants. After a long day, the women from the Antioch Missionary Baptist church made dinner for the 16 of us including fried pork chops and fried corn on the cob. None of us from Chicago had fried eaten fried corn on the cob before. Rev. Fields and I hadn’t eaten all day, and this meal tasted so incredibly good. We ended the day after dinner with a prayer by Rev. Hatch. He prayed for those in power to ensure that the citizens will get the medical attention they so badly need, and a healthy water system as soon as humanly possible. Our local churches have been generous, but we are still committed to a $4,000 contribution to the development of two reverse osmosis filtration systems to be built amidst the underserved population of Flint. Clean, uncontaminated water will be made available free of charge to anyone who needs it. If you want to help with this project, you can donate directly to Woodside Church at woodsidechurch.net. This is a joined United Church of Christ and American Baptist church in Flint.